This week brought two books, a steampunk and an urban fantasy that I’ve been hearing great things about! For book reviews, I’m currently writing one of Omens by Kelley Armstrong. It’s not nearly as glowing as the last few reviews I’ve written (Shattered Pillars by Elizabeth Bear, Magic Rises by Ilona Andrews, and The Best of All Possible Worlds by Karen Lord). 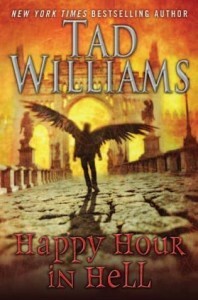 Happy Hour in Hell was just released on September 3 (hardcover, ebook). It follows The Dirty Streets of Heaven, which is now available in hardcover, ebook, and mass market paperback. The beginning of Happy Hour in Hell can be read on the publisher’s website (and if you missed the first book, an excerpt from The Dirty Streets of Heaven is also available). 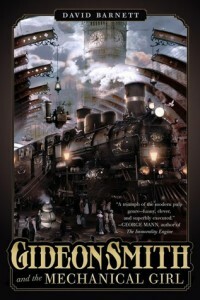 A third book in the series, Sleeping Late on Judgement Day, is forthcoming. My name’s Bobby Dollar, sometimes known as Doloriel, and of course, Hell isn’t a great place for someone like me – I’m an angel. They don’t like my kind down there, not even the slightly fallen variety. But they have my girlfriend, who happens to be a beautiful demon named Casimira, Countess of Cold Hands. Why does an angel have a demon girlfriend? Well, certainly not because it helps my career. She’s being held hostage by one of the nastiest, most powerful demons in all of the netherworld – Eligor, Grand Duke of Hell. He already hates me, and he’d like nothing better than to get his hands on me and rip my immortal soul right out of my borrowed but oh-so-mortal body.